The end. But not really. The term is actually an adverb that means in reference to business or proceedings that are adjourned and have no appointed date for resumption. In Georgia, by law, the General assembly has a 40 day session and the gavel must signify sine die at midnight on the 40th day, which of course, was last night, Thursday, April 2, 2015. However, last night, I was in the House to take pictures of the doors flinging open and the papers flying and it did not happen. At least the doors did not fling open. The Speaker of the House announced just moments before midnight that he was “just told” that the Senate would not be pronouncing Sine die at midnight but that they were “behind.” The speaker said they would “uphold the law” and pronounced Sine die at midnight. The papers flew and the floor rejoiced and members left the chamber. Apparently this is a rare occurrence and nobody really knew what it meant. Would the items the Senate voted on after midnight be valid? I still don’t have an answer on that one. To someone who is still an “outsider” to the ways of the political machine, sine die was a battle. It was a battle of wills. A battle of time. A battle of parties. A battle of chambers. And in the end, the only winners were those that had legislation that they happily reported “made it out” of the battle. The chambers seemed to be in constant criticism of each other about how much work had been done or “how many bills had been taken up.” There were comments made by the Senate leader about the House while the Governor visited the chamber to do his annual thank you to the legislators. There were comments made by the House leader when the Senate was not ready to “throw open the doors” at Sine die. Some bills surely got caught up in this back and forth. But so it goes in politics. Bonding with other aging advocates as we spend the late hours of the night together waiting! A hot topic in the Capitol this year were all the cityhood bills. Lots of arguing over annexation of this neighborhood into the area and so on and so forth. If you follow any news you saw Tucker, LaVista Hills and South Fulton in these bills. Well cities weren’t the only things to be annexed at the Capitol. Sine die was all about annexation! Annexation of one bill onto another to get it through before the gavel was struck (or not as in the case of the Senate)! It was hard to keep up with. A bill would come back to a chamber for an agree and next thing you know there are two new amendments- which turned out to be two bills- just stuck onto it. I had heard about this but to see it live and in action was quite amusing. You had to keep a trained ear when the legislator would get to the well to know what might be “tacked on.” The religions liberty bill tried to “attach itself” to other bills that were making their way through. But no can do for this bill. Nobody let that get by them. However, when the bill was truly “germane” (means applicable) and was supported along the way, it just didn’t have time to get through or something else held it up, these bills found their way through the law-making process by clinging on to another bill number like a parasite, hanging on for dear life. Two bills made it through by attaching themselves to one of our aging bills, HB 72, this session. All is well as they passed strongly! All bills will still need to go to the Governor’s office for a signature to become law. A final step that has to happen within the next 40 days as the Governor must sign the bills into law. He can choose to sign, ignore or veto the bills. We anticipate full support on all of our legislative issues that passed this year. My first session in state government is over. It is a bittersweet day. I looked forward to going to the Capitol and gleaning more each time. The build up to any “deadline” is filled with anticipation and excitement. And so there is always a “let down” too. (Like the day after a big event that you have spent many hours planning.) There is relief and happiness but there is some sadness in the passing of the moment too. I won’t be a “newbie” next year. I am on to my sophomore year. I hope you have enjoyed sharing in my freshman experience of Georgia politics. Most of all, I hope you have learned something. Learned something that might motivate you to take action on behalf of yourself or others. Learned something that might make you feel more comfortable about coming down to the Capitol to talk to your legislator or participate in a rally. There are so many ways to be an advocate! If you are passionate about senior issues, consider joining CO-AGE, the Coalition of Advocates for Georgia’s Elderly. We would love to have you be a part of our grassroots efforts. Thank you to my subscribers. Please feel free to share this blog with others. I will leave the posts up so they can be read from start to finish. Who knows? Maybe I will find something else to blog about soon. In the meantime, sine die. Who's Who Under the Gold Dome? Now that I have been roaming the halls of the state capitol for ten weeks I am beginning to know my way around (like where the single or double elevators are and the women’s restrooms ) and see familiar faces! It took a while to distinguish who does what around the marble halls. Once you become familiar with the “tagging” etiquette of the Capitol, you feel much more confident about whom to approach for what (and who to avoid). The Senators wear navy blue badges and The Representatives wear red badges (as seen above). I think they are well used to this custom and don’t have an issue with the color choice, but I have to admit that in my early days I thought the red and blue might distinguish party lines. 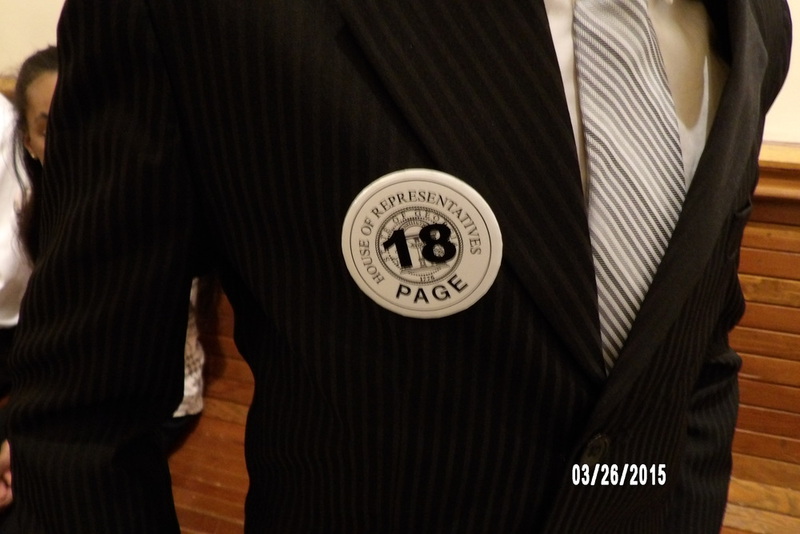 There are also gray badges which indicate Key House Personnel. These are folks like the Page Coordinators or those who tend the chamber doors, for example. The pages even get their own special “tag” on days they have the illustrious page role. It is a round button with a number so that you can remember which number page took your message onto the floor. Other color tags include Legislative Counsel/Fiscal office or Information Technology employees of the State, which are brown tags (I don’t see these all that often) and black tags for the Senate Interns. White badges with blue writing indicate Senate Staff and white badges that are smaller and have black writing are “Senator’s Spouse” badges. I have met several wives because of these badges and lines at the ladies restroom! If you are starting to be confused, feel free to study this “guide” of Senate and House Badges that is handily located in the doorway of the Senate chamber, lest you find yourself getting confused. This is one place where it is okay to look someone in the eye and then glance at their name badge. Right off the bat you can tell their level of stature here… then if you have the right glasses on or happen to have stellar vision you can grasp for a name in case you are not sure who you are speaking to. All of the tags listed above, except the page button, will get you through security without having to go through the metal detector…likely because they have all submitted to a background check at some point. I am fortunate enough to have two “official” badges. I have a State Employee badge that allows me access to the State Capitol buildings without having to submit to a security screening and I have a lobbyist badge. The lobbyist badge is the one you will see the most under the gold dome. I suspect they outnumber all the others. The badge is gray with a photo of the badge holder and the firm or organization they lobby on behalf of. Much to the chagrin of the lobbyists, this year they now require the lobbyists to pass through security like “normal visitors” to the capitol. Lucky for me I have that handy state badge to flash upon entry. And honestly I felt a little strange donning my “lobbyist” badge in the early weeks since I really did not know how to lobby just yet! Guess I did not want to be called an impostor. However, each day that has passed during this session I have gained more knowledge and more confidence. We are gliding into the last week- the 39th and 40th day of the session. When it started it seemed like it would be so long, but like so many other things in life, it has flown by. I will soon be experiencing and blogging about my first Sine Die (the last day of the session). I hope you will join me for my parting comments to the General Assembly next week! For those of you who do not know… I am a social worker. A small factor in my decision to major in social work in college was that there were no required science courses and just a “wee bit” of math courses required to graduate. The “wee bit” turned out to be statistics and I had to take it twice! Now I did learn how to balance my check book (although I did not do this as regularly as I should have in college and beyond) and years later learned how to manage a household budget in order to improve my marriage (this could be a whole ‘nother blog)! I am not a lover of numbers or as adept at them as I am at many other things. Why is this important to you? It is a good preface to my explanation of Georgia’s Fiscal Year 2016 budget. The Governor released his budget during the first week of the session. The House Appropriations Committee then hears from advocates and legislators and makes a budget recommendation that is voted on and must pass the House chamber, this year it is known as HB 76. The Senate Appropriations Committee then does the same and reviews the additions/cuts that the House made. The Senate then votes on their budget recommendations and it must pass the Senate (this occurred on Friday, March 20, 2015). The final step before going to the Governor’s office for signing is review by the Conference Committee (3 members of the House and 3 members of the Senate) to work out the differences between the two versions (House and Senate). This means there is one more opportunity to advocate or oppose changes in the budget to members of this committee. The Senate Budget and Evaluation office will post a document of the “differences” that should be able to be found here once it is ready. You can follow all of the above steps by Department and Line Item while reading the budget. The first column shows the Governor’s budget number, the middle column shows the House budget number and the far-right column shows the Senate budget number (designated by SAC). Feel free to choose this as easy reading (just 247 pages) over lunch today or with your morning coffee tomorrow. Click here to view. The budget is easily divided by Department in Alphabetical Order. It is easy to be intimidated by the 7,8 and 9 digit numbers (my household budget never gives me that experience) that are on this document, but don’t let the numbers scare you and read on. It is a public document and made for the average person to decipher so it can be done! Re-read the details of HCBS funding adds (please)! I posted mid-week on my blog with the exciting news of our additions to HCBS money. Guess what? I read the budget wrong and incorrectly reported. So here is my correction and admission of error. (Maybe this is why I prefaced this post about my college math experience!) I incorrectly reported that the Senate matched the $1.5 million from the House and added $384,000 to HCBS services. In fact, they kept in the 1.5 from the house and only added the $384,000. Their goal was to take 1,000 people off the HCBS wait list and that is what they did… not the 1,796 that I erroneously reported. You can read the details on page 119 of the 247 page budget, listed under Elder Community Living Services. Please don’t be disappointed because you thought the increase was double that due to reading the “Newbie blog!” An addition to any budget- household or state- is something to be grateful for. We are excited to report that the Senate Appropriations Chairman, Jack Hill has just summarized the Senate recommendations for FY 2016 (Wednesday, March 18, 2015). The Senate put in $1.88 million for HCBS (Home and Community Based Services). These services are critical to keeping elders in their homes and out of costly nursing homes. Some of the services included in HCBS are meals, in-home services, caregiver relief, adult day care and home modification. With the $1.5 million for HCBS that the House put in for FY 2016, we will be able to take approximately 1,796 people off the wait list for these services! Although this is well short of the $10 million ask to take 5,000 people off the wait list, aging advocates are pleased. For the last several years the funding for these services has been lower and we've even had to battle cuts. This gives hope that Georgia is taking a step in the right direction to tackling the growing needs of this demographic! The temperature outside is rising, the birds are chirping at a more fevered pitch and the daffodils’ yellow blooms are popping out across Atlanta. Nature is in its spring frenzy. So is the Georgia General Assembly. This week marks the days leading up to crossover day (Friday, March 13th) so the line is long at the Rules Committee meetings in both chambers. In my first year as a lobbyist at the Georgia Capitol I have learned that there are specific people who it is important (for the legislators) to have a good relationship with. Two of those people would be the Chairman of House Rules and the Chairman of Senate Rules. The two most powerful committees in each chamber are the Rules and the Appropriations Committees. In the House, the Speaker appoints all committee positions. The Senate Rules passed during the first day of the session. These two committees also comprise the most members of any committee. The Rules committee oversees the flow of legislation from passage in committee to making the determination of what bills should be debated and voted on the House floor. The House Rules Committee meets every morning at 9 AM on days the legislature is in session to determine which bills will be put to the floor for a vote on the next scheduled day. They can also add supplemental bills to the calendar for that given day. This happens more frequently as Crossover day approaches. Sponsors or supporters of bills must come to Rules and ask for the committee to consider their bill for a floor vote. Last Thursday, I attended the Senate Rules Committee. The Senate Rules Committee meets each day, immediately following adjournment, to set the Calendar for the next convening day. It was quite entertaining, as Chairman Jeff Mullis seemed to be roasting each person who presented a bill before committee. Perhaps the humor helps lighten the strain of one wielding so much power. For example, when the Religious Liberty bill was named, Chair Mullis, said “I see you are bringing a non-controversial bill before us today.” Each time a legislator approached the committee, the Chair had commentary that elicited chuckles from the crowd. This photo shows a long line of legislators waiting to have the floor during committee to ask for the favorable consideration of the committee to allow the bill out to the floor for a vote. You may have heard someone say “the bill got stuck in Rules” in reference to a bill that did not make it to law. A bill that never makes it through Rules will never have a chance to be voted on. During today’s House Rules meeting, there was a particular bill that had a proposed amendment. The chair, Rep. John Meadows, let the committee know that he would not release that bill for a vote until the amendment passed. The chair has control over what is proposed for a vote to be put on the calendar. Hence, you see the power the Chair of Rules wields. Luckily, our Elder Abuse Bill (HB 72) passed through House Rules today and will come to the House floor for a vote on Wednesday, March 11th, BEFORE Crossover day (Phew)! It looks like it will be long days for the legislators and lobbyists this week (Mon, Wed and Friday) because there are lots of bills on the calendar and even more to still be considered! For those who have been following my blog (thank you), I wanted to let you know that I did get to experience PB & J Day at the Capitol and taste the infamous Grilled Peanut Butter and Jelly Sandwich. I emphatically give it two-thumbs up and will certainly be giving it a try at home with my kids, for a new twist on one of our favorites. Here is a photo of the sandwich so you can at least imagine the taste. I also learned about the Peanut Proud Festival that is held in Blakely each year. This year it will be on Saturday, March 28th. I think you just might be able to get a grilled PB & J there if you are hankering for one. Click here for the details. Sessions vary across the U.S. The Georgia legislative session is only 40 days in length. There is not a standard amongst states regarding their sessions, each sets their own. For example, Florida holds a 60 day session, Alabama is 30 days and South Carolina has another way to do it. The Palmetto State has no limitation on the number of days during a legislative session just that it starts in January and must end by 5pm on the 1st Thursday in June. Some states hold their session in the winter months, some in the summer! Quite honestly, by comparison, Georgia seems to have a reasonable session. We’ve made it through half time. Not exactly the right terminology for state legislatures. Monday, February 23, 2015 marked the 20th day of the Georgia General Assembly so we have made it half way through the total of 40 days. The excitement and pace has changed Under the Gold Dome. There is a sense of urgency or anxiety that has replaced the excitement and everyone seems to be more determined than ever to move their pieces of legislation through the process. The next 10 days are crucial to the livelihood of a bill. Day 30 of the Georgia Legislative session is called Crossover day and holds significance. It is the last day for legislation to pass the chamber in which it was introduced and be transferred to the other chamber for consideration. Any bill that does not get a vote in its chamber by Day 30 cannot move further in the current legislative session. Because we are currently in a two-year session with no elections until Nov 2016, any bills still alive would begin their process again from the point they ended up. If it was an election year any legislation that does not make it through for a vote out of its chamber by Day 30 would be considered “dead” and would have to start the whole process again in the next session. This could be quite a disappointment for those hoping to get a bill through in one session; hence you see the reason for the “revving up” that occurs during this time at the Capitol. Crossover Day is scheduled for a Friday this year: March 13, 2015. I have read and been told that day 30 often lasts late into the night. Of course, it must adjourn by midnight. I find it odd that they would choose a Friday for this day. However, they are conveniently adjourning for a 4-day weekend immediately following so that the Savannah legislators can enjoy St. Patrick’s Day to the fullest (or at least that is what the lobbyists all conjure as the reason)! It is important to note that Crossover day is scheduled at the end of a week that convenes every other day. The General assembly will convene on Monday (9th), adjourn on Tuesday (10th), convene on Wednesday (11th) and so forth. This is to allow time for meetings, dealings and negotiations in order for legislators to get their Bills to the floor for a vote before the all- important 30th day is over! As we begin to see things heat up at the Capitol, the aging advocates are pleased to have one bill already crossed over from the House to the Senate (HB 86) but are awaiting Rules to put it on the floor for a vote. Our Elder Abuse bill (HB 72) has passed sub-committee and is waiting scheduling in full committee in the House. You can rest assured that we will be pressing hard to get it “out of the House” before Crossover Day. Stay tuned to my blog for my third and fourth quarter reports on my first experience of the Georgia General Assembly. We have a winner in the House! So I experienced my first vote in a chamber this week. 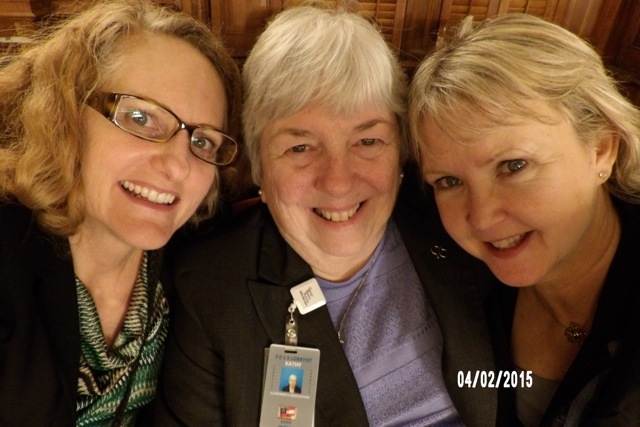 HB 86 that you know passed committee last week (if you read my blog…) went to the House floor for a vote on Wednesday. Last week I shared that the bill went to the Rules Committee. What you need to know about Rules is that this committee sets the calendar for the votes on the floor. Rules put HB 86 on the schedule for Wednesday. We had our Advocates at the Capitol poised to take action, if needed. What action, you might ask? Well, even on the day of the vote, it is important to get a pulse on the Bill. Is the talk favorable? This information comes from our sponsor or supporters in the House. They let us know what “the word on the street” is or rather “the word on the floor.” Our people let us know that there were a few who were on the fence and may need some clarification about this bill. We sprang into action and listed those folks, assigning a few to each of us. So we worked the ropes to pull these Representatives out and ask for their support! Now mind you, Wednesday the Capitol was crowded with advocates from dental hygienists to refugees. The line was down the hall and around the corner. So another strategy: have place holders in line. They would literally stand in line and get back in line so that we could continually request the legislators come out. I got lucky! The representative on my list came out and as I launched into what I wanted to talk about he said. “I’m voting yes. I’m for it.” He even put his hand behind his back mimicking that I had twisted his arm. That was easy! It felt as though we might be in for a unanimous vote. Oh and did I mention that while we are doing all this we don’t know if the vote has already started? Although each chamber puts out a “calendar” of what will be read and voted on the floor each day, there is no time frame. In the House, the Speaker gets to pick the order. In the Senate, they do go in order of the calendar. So while we are working the ropes we are also trying to keep an eye on the monitor to see if it is time. Once we know, we all gather around the monitor to hear the reading and watch the vote! Pictured here. Once the vote is called for, the monitor changes to the Electronic Voting System. There are lots of bells going off and the screen is ticking off the Green Y or the Red N next to the Legislators name. I wasn’t really sure what I was looking for but I did notice a lot of Green! Green is Yea, Red is Nay and there is also an E that means excused for those who are not in the Chamber for the vote. Much celebrating occurred as we realized our first legislation of the session had made it through the House by a 160 to 3 vote! I was thrilled and riding the wave of excitement too. If you are like I was a few weeks ago, you know little about how lobbying goes on under the Gold Dome or at any Capitol, for that matter. I am learning the ropes as I go and I will fill you in on a lot of secrets! Well, actually they are not really secrets. You just feel as though someone is keeping something from you if they are using lingo you don’t quite understand. If you “know the ropes” at the Capitol you would be “working the ropes.” Simply put this means you are talking to legislators about what is important to you. It is termed this way because the legislators are “roped” off in front of their respective chamber, the House or the Senate. The legislators can go behind the ropes, but the rest of us must remain on the other side. You can linger near the ropes in hopes of catching the elected official you want to speak to… or you can request your legislator come out of the chamber to the ropes to meet you. There is a strategy here. To make a request you must use the service of a page. Each chamber has a request form to complete that is then assigned to a page. A page? Another bit of lingo you should know. Pages are messengers. They have been in use since early days of the US Congress. School age children sign up for this role. A page will take your request into the legislator and come back with a response or they let you know the person is not at their seat. In this case, you might try again later. Either way, you have to test your memory skills here and recall who your page is… remember their hair, their clothes or their number. Something. Monday was challenging because the pages were ROTC students so they all had on the same uniform. The second week of the session was a busy one for aging advocates. 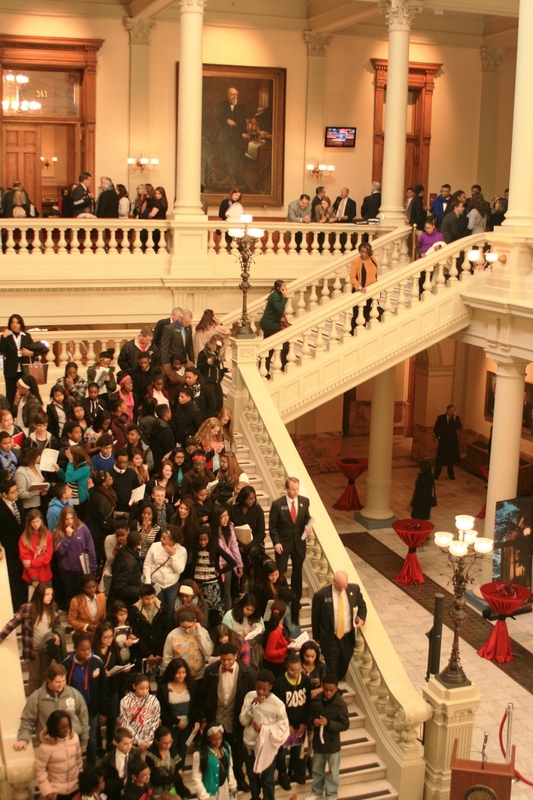 We had over 500 advocates come to the Capitol for Senior Day. Our guides helped them work the ropes. We had three bills dropped since my last post. Dropped? That doesn’t sound good if you don’t know the lingo. But what that means is three issues that we are supporting legislation for now have sponsors. The bills have been dropped into the process and have been assigned a number. So this is a good thing! Visit our home page to get updates on HB 72, HB 86 and HB 92. As I continue to work the ropes and learn the ropes, I will continue to share with you what I learn… so read on next week. You are sure to expand your knowledge beyond grade school civics. Bonus: Want your school age child to be a page? Click here for more information. My first-ever week at the Georgia General Assembly was like “old home week.” So although I am not from New England and rarely go back to my “home” city of Miami, I would describe the first week of the legislative session like this. From lots of excitement and greeting of people one hasn’t seen in a while, lots of pomp and circumstance each day to the Governor’s much anticipated State of the State address, the energy is palpable. I was also never in a sorority, but I would liken the first days at the capitol to a reunion of a college sorority or fraternity when you have a “connection” with the people that are gathering but you may not necessarily see them very often, agree with them or even like them. On the first day at 9:15am, as I am just starting to learn my way around this beautiful, historical building, I made the mistake of walking up the stairs to the third floor on the North side of the Capitol. This is where the “for profit” or business lobbyists position themselves. It was buzzing with people and excitement. Then I realized as I reached the top of the stairs that our “meeting spot” was not there? I looked around and realized I was on the “wrong side” of the Capitol. I made my way by the ropes of the House chambers only to look in and see many young children, fancily dressed also heading into the chambers. These were the children of legislators who were “allowed in” on this first day for a swearing in. How exciting this must be for them. The South end of the Capitol was also buzzing; however at not nearly as high a pitch as the other end. I felt a little pang of disappointment. I am not yet in this sorority so I did not have old friends to greet. I felt a bit intimidated. I quickly recalled the words I heard in a recent advocate training when describing the Capitol - “this is the people’s building” – and straightened my back and held my head up to greet the few familiar faces I could now see gathering in the “aging advocates” area. I can already see that this experience of advocating for seniors, the population I have the most affinity and love for (throughout all of my 20+ years as a social worker) will be filled with these ups and downs of emotions. There will be victories and there will be disappointments, but I am now a voice for all of those elders I love and I must have their (collective) voice heard! I will be continuing my “newbie blog” throughout the 2015 session. If you’ve ever wondered what it would be like, I will share my journey with you so I hope you will feel “at home” and continue to read.